Remember how I said that every time you answer a question about this family, another one springs up in the original question’s place? Death, marriage, and birth (yes, even though he was born in the 1880s, birth) records for William E. Campbell do just that. William Ernest Campbell, a conductor/driver for the Cleveland Transit Co., who died in Lake Lucerne, Geauga County, Ohio on 16 May 1962, was born in Ohio on 29 January 1886. His wife, Mary H. Campbell, was the informant for his death certificate, and she either did not know or couldn’t recall her husband’s parent’s names. Speaking of William’s first wife, her maiden name was Evelyn I. McEachern, and they were married on 3 January 1910 in Cleveland. (You’re going to want to remember Evelyn’s parents, William McEachern and Evelyn Endean, for later). According to the application, William was the sole applicant/informant. Even though Fannie Campbell would be listed as his mother on the 1910 census just months after the Campbell-McEachern marriage,7 William either didn’t know or couldn’t remember his own mother’s name when he applied for the license. It’s beginning to look more and more like Fannie Campbell was not William’s biological mother. Remember how I mentioned that Evelyn I. McEachern was my great-great grandmother, but William was not my great-great grandfather? Well, way back when you still had to write the Cuyahoga County Archives to request a copy by mail, the Campbell-McEachern marriage record was my first encounter with William E. Campbell, and we are just not going to talk about how much time I spent trying to find a record of him in Los Angeles to no avail before I untangled this knot. Nope. 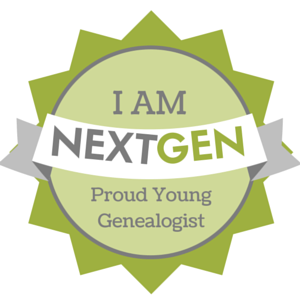 Not gonna talk about it–except to say that negative evidence is still a form of evidence,8 and to remind everyone that almost no genealogical record can be absolutely 100% trusted in and of itself. William E. Campbell, who married Evelyn I. McEachern in Cleveland in 1910 was not born in Los Angeles. Recording errors happen, people misspeak or they forget, and sometimes people lie. I think there’s a chance William intentionally bent the truth about his birthplace, but we’ll get to that (and his genuine connection to Los Angeles) later. On 12 September 1918, William Campbell registered for the World War I draft. He provided the registrar with his full name, his birth date, his occupation, and his address: 9601 Lamontier,10 which was also his residence when the 1920 census was taken.11 While not a vital record per se, World War I draft cards are often some of the earliest records of vital statistics for men of William Campbell’s generation. But do you know why I love Ohio? Because Ohio state law mandated civil birth registration beginning in 1867,12 decades before it became standard practice for the entire U.S. in the early twentieth century. Although this Return of a Birth doesn’t list the baby’s name, there’s enough information to more than reasonably conclude that it’s a record of William Ernest Campbell’s birth. The birth date and year match his death certificate, as well as both of his marriage applications. The father’s name and nativity, James Campbell from England, is consistent with both marriage applications and the 1900 Census.14 The mother’s surname, “Nagle,” is consistent with the Campbell-Wilson marriage application, spelling aside, and her nativity “American,” is consistent with the 1910 through 1930 Censuses.15 Finally, the address, 7 McCurdy St, is consistent with the James Campbell family’s address in 1900 (56 McCurdy St),16 house number aside. Unless Mary (Naegel/Nagle) Campbell started going by Fannie later in life, it seems highly unlikely that Fannie Campbell was William E. Campbell’s biological mother. She wasn’t, by the way, and we’ll get into the proof in Part Three: The James and Mary C. Nagle Family. Fannie was related to William in other ways though (that’s right, I said ways again), and I don’t just mean as his stepmother. We’ll get there. Was William Campbell’s mother from England? Or was she from New York, or Pennsylvania? Was Fannie Campbell actually William’s biological mother? Did Fannie have ten children, two of whom survived, or six children, all of whom survived? When exactly was William E. Campbell born? (The smaller fluctuations in his age from census to census might be resolved by comparing his birth month to the official census date, but other shifts are too large to be tidied up that way.) William Ernest Campbell was born to James and Mary (Nagle) Campbell in Cleveland, Ohio on 29 January 1886. Did Fannie Campbell die before 1920, or did she just move out? Are Eveleyin and Mary Campbell the same person? No. Evelyn I. McEachern was William’s first wife, Mary H. Wilson was his second. What were James and Fannie Campbell each up to before they got married in their thirties? What was William E. Campbell’s connection to Los Angeles, California? If Fannie Campbell and Mary Naegel/Nagle are not the same person, what happened to Mary prior to 1900? Note the mention of his previous residence, Bedford, which is consistent with the 1930 and 1940 Censuses.18 Along with McEachern and Endean, Morris is another name you’re going to want to remember for later. Oh, and while we’re on the subject of names to remember for later: did I mention last time that John Callan, who lived with William and Mary Campbell in 1920,19 was more than just a boarder? If this story seems more straightforward than a Gordian Knot so far, stick with me. Even though William’s marriage to my great-great grandmother Evelyn I. McEachern lasted less than three years, she plays a bigger role than simply “first wife,” and you haven’t seen the last of her. Oh man, have you got me hooked! This is genalogical writing at its finest. Well done. Can’t wait to read part three! So maybe we should start the Genealogy detective club? Great investigative work. Looking forward to the next part (which I suspect is not the last!). Love your writing style. Yep, it’s not even close to the last. And thank you! This is so much like some of my genealogical searches! Concept of Gordian knot totally fits! I, too, sometimes ‘started in the middle’. Nicely done. Your citations and writing form an excellent model. Thank you.